So you’re out for a hike or a walk in nature and you are certain you heard a hiss or saw a slimy creature slithering through the bushes; don’t worry, keep calm. Although your first instinct might be to run away or find a “weapon” to slay the vile creature, you must resist the urge. Wild snakes are not the vicious attacking beasts that we see portrayed on television; in fact, in addition to being close to blind and deaf, they are timid creatures and will slither away before attacking. They are more afraid of us than we are of them. If you do come across a snake while you are out, stand still and give it a chance to slither away: then, reach for your camera and get a few quick shots. I’m sure your friends and colleagues would enjoy a tale of your close encounter; especially if you have evidence to prove it. Since most of us might not be able to identify the type of snake we might encounter throughout the Blue Ridge area, I have created a list of some of the most common reptiles, so be on the lookout with camera in hand. Measuring between 36 and 48 in. fully grown, this elegant glossy black snake has white to cream markings/crossbars on its back and black and white patches on its belly. 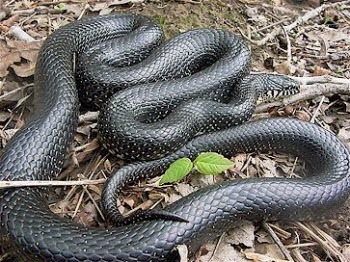 The Black King Snake prefers hardwood forests, abandoned fields, freshwater marshes and habitats along streams and creeks. When threatened, the snake will vibrate its tail and emit musk from the base of its tail; it may also roll its body into a ball and hide its head, in an attempt to protect itself. This heavy bodied venomous pit viper inhabits fields, rocky hillsides and woodland edges. 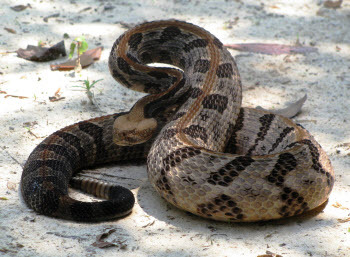 The Timber Rattlesnake can grow up to 68 in. long and release a large amount of venom from its fangs as an adult. It feeds on small birds, frogs, rabbits and other snakes. Although more dangerous than many others, the Timber Rattlesnake prefers to be left alone and usually rattles and feints tremendously before striking. 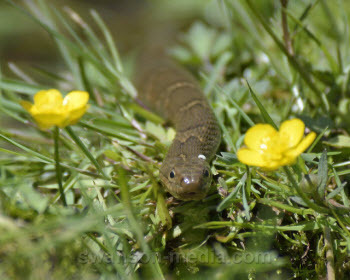 This is another venomous type snake. 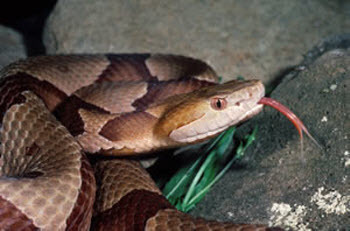 Copperheads inhabit areas similar to that of the Timber rattlesnake. This snake can be identified by its rectangular shaped head and their copper or pinkish-brown scales covered by brown cross-bands. The yellow color at the end of their tails helps to lure preys closer. The snake is active in the days during Spring and Fall; it becomes nocturnal during Summer months and hibernates through Winter. These are small slender snakes, as the name suggests; with a ring around their necks. Adults range in size from 10 – 15in. and are grey to bluish black in color. 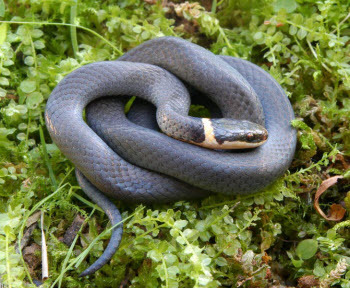 Ring-necked snakes can be found in moist wooded areas where there are loose barks, rotting logs and old stumps. Although it is the most common snake in the Shenandoah National Park, the ring-necked snake is not frequently spotted in the open. This snake feeds on small insects, lizards and frogs: it usually swallows its preys whole, using some amount of constricting. The Garter snakes are one of my favorite snakes to look at. They have a variety of colors among them however, they each have a strip running down the back which may be; yellowish, greenish or brownish. They normally grow up to four feet long and are mostly located in pine forests, lowland and upland grassland, margins of creeks, ponds and freshwater marshes. 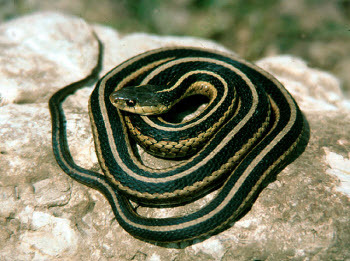 Garter snakes consume earthworms, various other insects and frogs to survive. Brown, gray, reddish or brownish-black in color, this nonvenomous snake may grow up to four feet long. The Northern Water snake hunts fish, frogs and crayfish at water’s edge and can be seen basking on stumps or rocks during the day. This snake will bite furiously and repeatedly when agitated; although it is not poisonous, it can still hurt. Snakes in the wild are not a real threat to humans; they just want to be left alone. Snakes may attack if they are threatened; they are simply trying to defend themselves. If you get the rare opportunity to encounter a snake in the wild, stay still, allow it to slither away and take a picture: if you are quick enough.